Originally Sideshow Bob was only supposed to step on a rake once after emerging from the underside of the Simpsons’ vehicle while stalking Bart, but the episode was running extremely short so the writers decided to sadistically drag out the gag by having Sideshow Bob step on one rake, then another, then another, then another, then another, then another, then another, then another, and then finally step on a ninth and final rake. I have dubbed this technique The Rake Effect. The idea is that a gag is first funny, then repeated often enough that it becomes unfunny, and then exhausting before cycling back to being even funnier than it was the first time. The Rake Effect is a case study in the joys and agonies of repetition but it wouldn’t be anywhere near as funny as it is if it weren’t for the squirming, palpable humiliation in Sideshow Bob’s voice every time he takes a new step and ends up with another rake in his face for his troubles. The Rake Effect is a comedy milestone but I had forgotten about a possibly even more inspired use of repetition driven to its comic extreme when, late into “Cape Feare,” Sideshow Bob is lying down in the middle of the road talking to Bart when an entire parade unexpectedly descends down the street. “Not the elephants!” yells Bob in abject, understandable horror before not one, not two, not three, not four, not five, but six elephants stomp Bob in rapid succession while parading down the streets wearing garments very slowly spelling out the message, “Terror Lake Salutes Hannibal Crossing The Alps.” It’s a gag that succeeds through giddy excess: The idea of a single elephant appearing in a small town parade is far-fetched; that the town could somehow muster up six elephants to make Bob’s life hell is wonderfully preposterous. Ah, but we are once again getting ahead of ourselves. For “Cape Feare” is, as its title betrays, an unusually pure parody of both the 1962 noir classic Cape Fear and the blockbuster Martin Scorsese-directed remake. Part of what makes it so pure is the absence of B- and C-stories. Pretty much the entire episode is devoted to a single narrative taken wholesale from Cape Fear: A revenge-crazed criminal gets out of jail and methodically and deliberately stalks the family of the person he holds responsible for his imprisonment (other than himself and his own crimes of course). “Cape Feare” further pads out its running time with a series of elaborate fake-outs after Bart learns that someone wants to kill him—but hw doesn’t know who (though it really shouldn’t be that hard to figure out, given Bart’s history with Sideshow Bob). First Marge menacingly tells her son, “Bart, I am going to get you…” before sunnily explaining, “…some ice cream at the store since I’m saving so much money on Diet Cola!” Next Ned Flanders pops up bearing terrifying Freddy Krueger-like finger gloves and hissing, “Say your prayers, Simpson!” before chipperly continuing, “Because the schools can’t force you like they should!” Finally Ms. Krabappel lunges maniacally at Bart to tell him, ““You’re going to be my murder victim Bart…” before finishing, “…in our school production of Lizzie Borden starring Martin Prince as Lizzie!” But it’s all a time-killing and very amusing means of misdirection, for we all know that the blood-crazed fiend in question is Sideshow Bob. Rewatching The Simpsons for TV Club Classic has given me a new appreciation for the show’s animation. 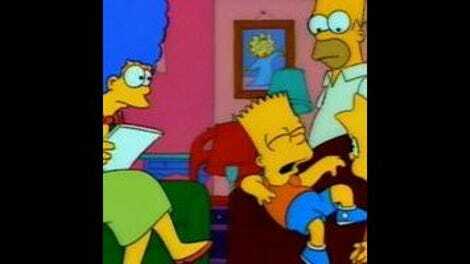 Take this magnificent sequence, which pulls back from Bart brooding darkly at his bedroom window to high above Springfield before zooming forcefully across town to dark storm clouds and then finally to Springfield Prison, where Sideshow Bob is scrawling, “See you soon Bart” in blood, then pushing his luck by also writing to Reader’s Digest in his own blood. That’s an awful long way to go for a single joke, however inspired (that Sideshow Bob writes everything in his own blood, not just threats) but it helps establish an appropriately ominous tone and is gorgeous in its own right. Sideshow Bob makes it out of prison after convincing the parole board that the “Die Bart Die” carved into his body is simply German for “The Bart The” and The Simpsons go into the witness protection program as The Thompsons, which leads to a loving riff on the show’s opening, this time featuring Springfield’s first family’s new name. Another show might stretch out this idea for a minute and a half—especially when they very famously have a whole lot of time to fill—but The Simpsons was so comedically dense at the time that the whole sequence takes well under 20 seconds. 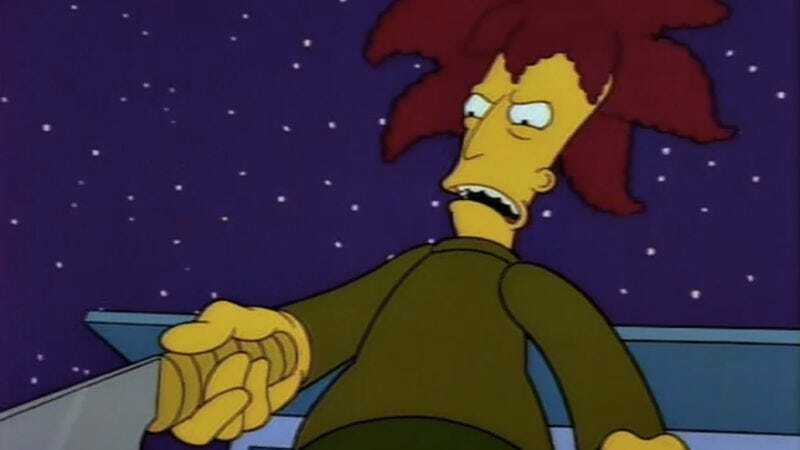 “Cape Feare” has a lot of fun subjecting Sideshow Bob to all manner of physical and emotional humiliation. He doesn’t just step on a rake nine times and get stomped by six elephants: he’s also driven through a cactus patch while perched underneath the Simpson’s vehicle. He endures so much pain you almost feel sorry for the guy. Almost. Sideshow Bob finally corners Bart on the houseboat where the Simpsons have taken up temporary residence but the enterprising young man finds a brilliant way to stall for time by asking Sideshow Bob to perform H.M.S Pinafore in its entirety. Bob can’t resist this stoking of his ego so he doesn’t just sing H.M.S Pinafore: He treats his audience of one to a full-on dress performance, complete with regular costume changes. “Cape Feare” turns limitations into strengths by spinning the need to fill out time into some of the series’ sharpest, funniest and weirdest gags. The Rake Effect might be its greatest gift to comedy but its virtues go far beyond that. Sideshow Bob episodes consistently rank among the show’s best and this represents the gold standard all subsequent Sideshow Bob episodes aspire to. This has some great cutaways; I particularly love Homer’s fantasy of becoming John Elway while inexplicably wearing football gear from the 1920s. Next up is “Homer Goes To College.” If memory serves, that’s a good one.